In an announcement today, Ricoh stated that they have "reached a diffenative statement to purchase IKON through it's wholly owned U.S. distribution subsidiary, Ricoh Americas Corporation." "IKON has terrific strength in areas that complement RICOH's growth strategy," said Shiro Kondo, President and CEO of Ricoh Company, Ltd. "IKON has advanced Professional Services capabilities with a long list of satisfied large customers. IKON is respected as well for its production print sales and service expertise. We are excited to add the very experienced IKON management team and the thousands of skilled and dedicated IKON employees to the RICOH family." IKON Chairman and Chief Executive Officer, Matthew J. Espe, said, "Following an extensive review of our strategic opportunities, our Board conducted a formal process to evaluate alternatives for the Company, and has approved this attractive transaction for our shareholders, customers and employees. The offer represents a 33% premium over IKON's trailing 60-day average stock price as of market close on August 26th. In addition, combining with RICOH, one of the world's most respected and innovative companies, will enable us to strengthen our offerings to customers and create new opportunities for our employees." Espe concluded, "We remain fully committed to providing the highest quality of support and service to all our customers." 33% premium? Try $1.6 billion! That's it. Was it a fire sale? A missed opportunity for HP. 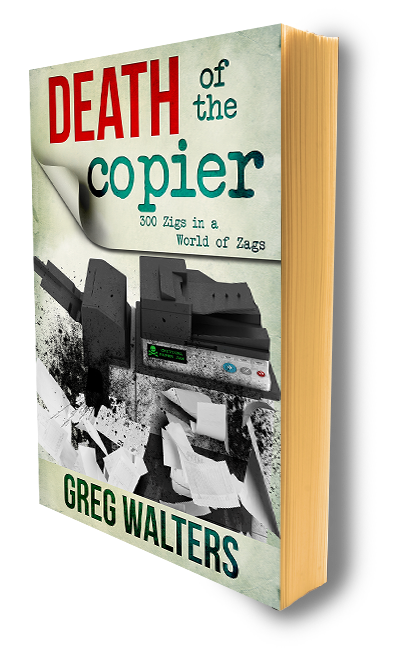 A bargain price for huge channel for copiers and printers - 14 billion they spend on EDS. So now, one question answered and oh so many more are asked. What about ALL of the IKON Canon customers? Will it be a feeding frenzy as competitors start picking away at Canon, Kyocera and Konica Minolta installs? "Ikon eliminated about 350 jobs in January to trim costs after first-quarter profit fell 45 percent. The company has also reduced executive bonuses as sales fell for 11 straight periods through the third quarter of 2007. Canon Inc., the largest Japanese office equipment maker, has lost about 50 percent of its U.S. distribution network as the distributors have been bought by printer makers. Xerox Corp. bought Global Imaging Systems for $1.67 billion last May to expand its small- and mid-sized business sales. Konica Minolta Holdings Inc. bought London-based Danka's U.S. unit for $240 million in June. ``The biggest question is what Canon's response will be,'' said Cross. ``Does another bidder emerge?'' Canon spokeswoman Patricia Hall declined to comment. "Canon machines represent 60 percent of the products Ikon handles at the moment, with Ricoh machines accounting for 30 percent. But Ricoh aims to replace Canon products with its own printers and copiers in three to four years, Chief Financial Officer Zenji Miura said." Should HP Purchase IKON's PS Division? - Delicious! !